Workers at a Schiller Park Hostess plant and millions of people who have eaten Hostess and Dolly Madison snack cakes may have been exposed to asbestos for the last 25 years, a lawsuit filed Tuesday alleges. 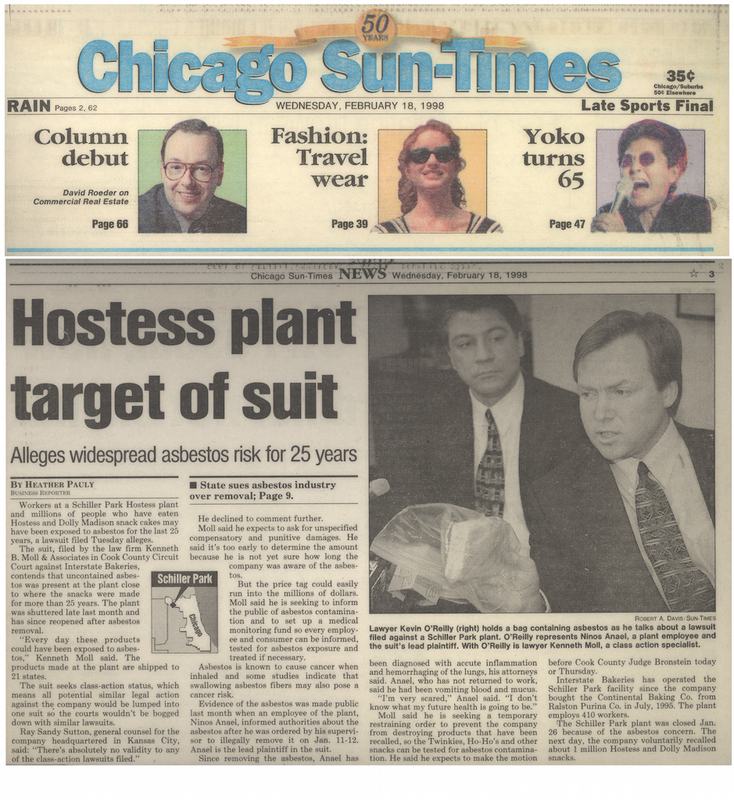 The suit, filed by the law firm Kenneth B. Moll & Associates in Cook County Circuit Court against Interstate Bakeries, contends that uncontained asbestos was present at the plant close to where the snacks were made for more than 25 years. The plant was shuttered late last month and has since reopened after asbestos removal. "Every day these products could have been exposed to asbestos," Kenneth Moll said. The products made at the plant are shipped to 21 states. The suit seeks class-action status, which means all potential similar legal action against the company would be lumped into one suit so the courts wouldn't be bogged down with similar lawsuits. Ray Sandy Sutton, general counsel for the company headquartered in Kansas City, said: "There's absolutely no validity to any of the class-action lawsuits filed." Moll said he expects to ask for unspecified compensatory and punitive damages. He said it's too early to determine the amount because he is not yet sure how long the company was aware of the asbestos. But the price tag could easily run into the millions of dollars. Moll said he is seeking to inform the public of asbestos contamination and to set up a medical monitoring fund so every employee and consumer can be informed, tested for asbestos exposure and treated if necessary. Asbestos is known to cause cancer when inhaled and some studies indicate that swallowing asbestos fibers may also pose cancer risk. Evidence of the asbestos was made public last month when an employee of the plant, Ninos Anael, informed authorities about the asbestos after he was ordered by his supervisor to illegally remove it on Jan. 11-12. Anael is the lead plaintiff in the suit. Since removing the asbestos, Anael has been diagnosed with accute (sic) inflamation and hemorrhaging of the lungs, his attorneys said. Anael, who has not returned to work, said he had been vomiting blood and mucus. "I'm very scared," Anael said. "I don't know what my future health is going to be." Moll said he is seeking a temporary restraining order to prevent the company from destroying products that have been recalled, so the Twinkies, Ho-Ho's and other snacks can be tested for asbestos contamination. He said he expects to make the motion before Cook County Judge Bronstein today or Thursday. Interstate Bakeries has operated the Schiller Park facility since the company bought The Continental Baking Co. from Ralston Purina Co. in July, 1995. The plant employs 410 workers. The Schiller Park plant was closed Jan. 26 because of the asbestos concern. The next day, the company voluntarily recalled about 1 million Hostess and Dolly Madison snacks.